Hello! It's me. I'm so glad you are still here. I've been missing on the blog recently as we've just moved house. But I'm happy to report that after a couple of insane weeks of packing, cleaning and unpacking, we are mostly settled in and I'm back to my regular routine. While this was happening, winter seems to have well and truly set it. You won't find me complaining, because I LOVE winter. Its the season for soups, stews, warm puddings and lots of baking - all my favorite kind of things. Speaking of warm puddings, I have a list of them I want to make this winter and hope the next few weeks will give me an opportunity to share them with you here. 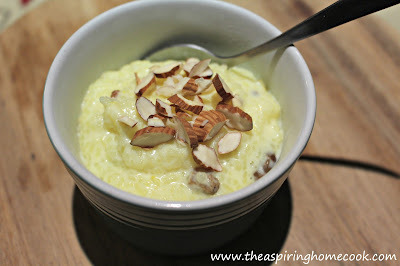 I have always wanted to try making some rice pudding (known as kheer in India) at home. Each time I walk by the frozen dessert section at Coles, I'm tempted to pick up a pot of rice pudding. But I don't, because surely it couldn't be too hard to make some at home. The problem is, I just never got around to doing it. Until now. Usually rice pudding is made using uncooked rice. I recently found myself with some leftover plain Basmati rice from lunch and I didn't want it to go to waste. Waste not, want not, right? So I decided that I was going to try and use it to make some rice pudding instead. After a little searching, I found just the recipe I was looking for. A no-nonsense approach to a rice pudding that used leftover rice. You've probably ended up with some extra rice from an Indian takeout lunch / dinner on occasion. Don't throw that stuff out. Transform it into this glorious, rich and creamy rice pudding in no time with a few pantry staples. BTW has anyone seen the latest mini series on ABC called War on Waste. Such an eye opener. It is shocking how much food is wasted regularly in households, among other wastage. This is a great way of reducing household food wastage. I love finding ways to reduce wastage. Do you have any recipes that use leftovers and cut down on food wastage? Tag them on Instagram using #MyWarOnWaste and lets help inspire people to reduce waste. So go ahead and try it out. You can serve it as a beautiful tea time treat or as dessert. Any leftovers can be refrigerated. You can enjoy your rice pudding both warm or cold. Personally, I prefer mine warm, which works really well on colder days. I'm really glad I tried making this pudding at home. Who knew that something this tasty and satisfying could be this simple to make. My rice pudding has a yellowish tint because I added a few strands of saffron to the pot while cooking it. You can leave it out and it will look like regular rice pudding. Place the rice, milk, sugar, cardamom powder and saffron strands in a pot. Cook on medium heat, stirring continuously but gently. Scrape down the sides and the bottom of the pan regularly. Cook till the milk has reduced and has become a thick, cream like consistency. It is okay if some of the rice grains break down. It helps thickening the pudding. But don't mash the rice completely. You want a little texture in there. How thick you want the pudding to be, is upto you. Just before it is done, add the raisins. Turn it off the heat when it has thickened to your liking. I find that heating the raisins through the pudding plumps them up a bit and makes them extra yummy, rather than just placing the raisins on top. Serve in bowls and top with some sliced / chopped almonds. If you want more ideas like this to help reduce food wastage and save money, follow me on Pinterest here. I clicked submit my comment didn't show up. Grrrr... well I'm not writing all that over again. Anyways, just wanted to say superb blog!